All languages have negation markers, which allow the speakers to deny something, for instance the presence of an object (there is not bread), a feature (John is not cleaver), an action (you do not play piano), and event (it does not rain) or a concept (a dauphin is not a fish). In some cases, the representation of the negated entity seems to be suppressed or inhibited. Thus, reading “there is no bread” immediately makes the concept “bread” less available in the reader’s mind, compared to reading the affirmative statement “there is bread”. Neuroimaging studies, for their part, have also reported that negative action-related sentences generally reduce the activation of motor and premotor cortex in comparison with affirmative action sentences. Fig. 1. Outline of a trial involving reading a sentence embedded in a Go/NoGo task. In spite of the many studies on the cognitive and neural consequences of negation, negation remains itself an unexplained neural black box. We propose the new hypothesis that understanding sentential negation partially reuses the neurophysiological mechanisms of response inhibition. Response inhibition consists of cancelling planned actions or suppressing alternative behaviors or representations that are inappropriate, unsafe or no longer required (e.g., stopping to walk to avoid an approaching car). One way to test response inhibition in the laboratory is using the Go/NoGo task, in which participants are asked to perform speeded responses in the frequent Go trials (e.g., pressing a button in response to a red circle) and to suppress or inhibit the response (e.g., to a blue circle) in a minority of NoGo trials. The electroencephalograph signal (EEG) usually shows power enhancement in the low-frequency theta rhythms (4-7 Hz) and sometimes delta rhythms (2–3 Hz) over fronto-central sites, as neural markers of inhibition during NoGo trials. In our study, we tested the hypothesis that the general mechanisms of behavior inhibition are involved in the proper understanding of negation by asking participants to understand sentences with affirmative or negative polarity embedded in a Go/NoGo task, as illustrated in Figure 1. 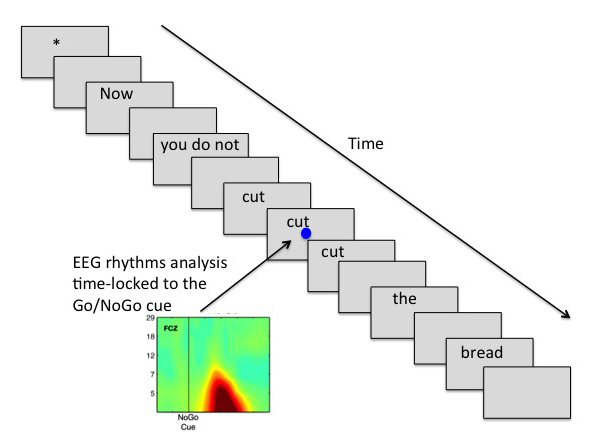 If negation shares neural resources with response inhibition, we may expect that theta rhythms, whose power increases in the NoGo condition, will be modulated by negative sentences. For NoGo trials the increase in fronto-central theta power was larger in the context of affirmative sentences than in negative sentences, whereas for Go trials delta power was larger in the context of negative sentences than in affirmative sentence, as Figure 2 shows. In other words, grammatical negation modulates neurophysiological markers of response inhibition. Fig. 2. 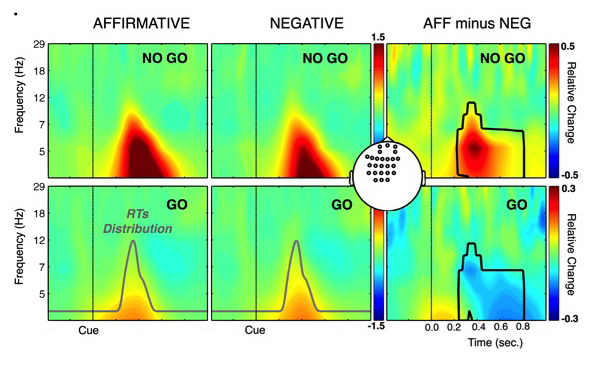 Interaction between sentence polarity (affirmative vs. negative) and Go/NoGo task observed in the EEG theta rhythms for NoGo trials (upper boxes) and delta rhythms for Go trials (lower boxes). We suggest that in the negative-NoGo trials the negated meaning may be represented in the brain as a degraded stop signal, pre-setting the response inhibition processes before the NoGo cue appears and consequently reducing the neural inhibitory response (smaller increase in theta power) in comparison with affirmative-NoGo trials. By contrast, in Go trials there was a later increase in delta power in negative compared to affirmative sentences, which could index a post-response conflict evaluation in negative-Go trials (see Go reaction times distribution in Figure 2). In sum, we have demonstrated that understanding sentences with the syntactic operator of negation relies on the neural machinery response inhibition processes. Sentential Negation Might Share Neurophysiological Mechanisms with Action Inhibition. Evidence from Frontal Theta Rhythm.